Coming up in 2014… 52 in 52 Challenge! Okay! So recently I’ve been thinking, I should read more. For one, there are several books lying around my room that I’ve been meaning to read and haven’t got around to it. There are books that are considered almost quintessential that I have never even looked at which I feel guilty about every time I hear their titles mentioned. I also want to discover new and exciting novels that maybe not everyone has heard of. Sparked off by a thread seen on a forum I frequent, I have decided that in 2014 I shall attempt to read 52 books, roughly one a week, hence the 52 in 52. By doing this I hope to kick start my reading again, which over the past few years has dwindled from a necessary part of my life to something I do for pleasure maybe once every couple of months. You may have noticed the list of books in black at the end of the list. These are my back up books, in case I cannot get hold of one of my main-list books for when I need it. This way I will still have a book to read. 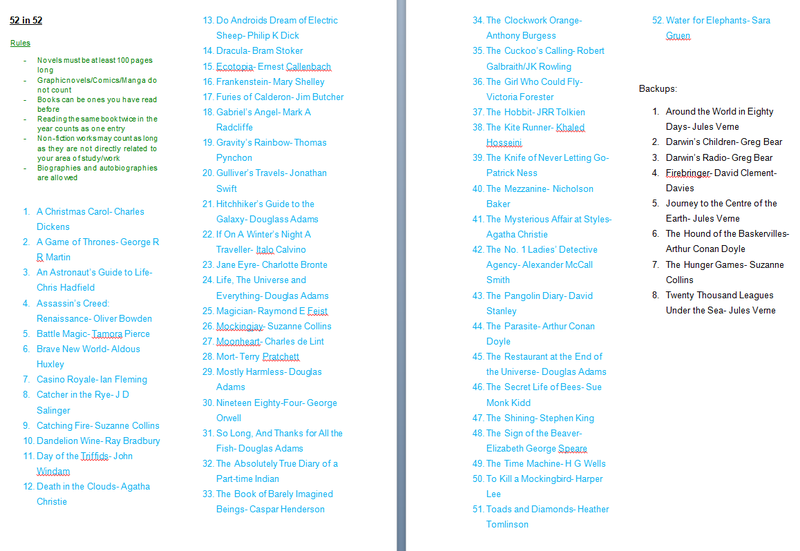 During the year I will keep you updated on my progress and what I felt about the books I will be reading. See you in the New Year for some book action!